Amsterdam is a beautiful European destination that is famous for their canals. A visit to this city, also known as the Venice of the North, will not be complete if you miss cruising the waterways. Are you looking for the ideal and Muslim Friendly Amsterdam canal cruise online package? Then, you should grab this online ticket now to enjoy a relaxing and educational cruising during you Halal holiday in the Netherlands. The history of Amsterdam canals goes back to Amsterdam’s Golden Era in the 17th century. This is the time when the canals were built throughout the city, dividing it into several districts. In the old days, these canals were used to transport merchandises. Today, it has become one of the main attractions amongst tourists as many Muslim travellers look forward to cruise it to complete their Halal vacation in Amsterdam! 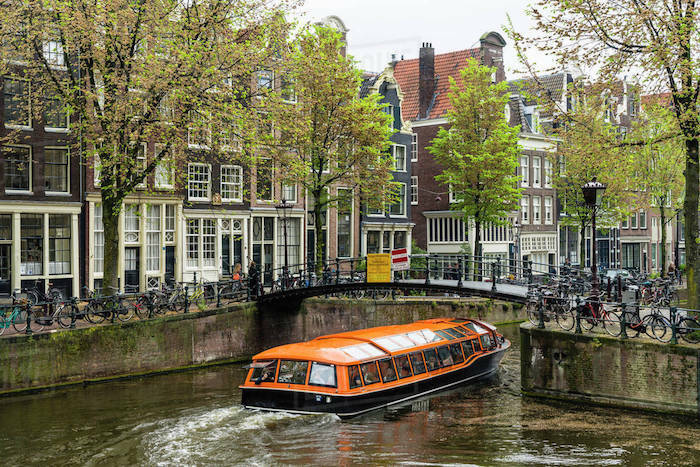 With this Amsterdam canal cruise deal, you can cruise the three main canals in Amsterdam – Herengracht, Prinsengracht, and Keizersgracht. Hitting the capital city of the Netherlands soon? Grab this Muslim friendly Amsterdam canal cruise online package by purchasing the online ticket for only $18.15 (€16). This travel deal covers a 1-hour tour that is guided by GPS and multi-lingual audio guide. 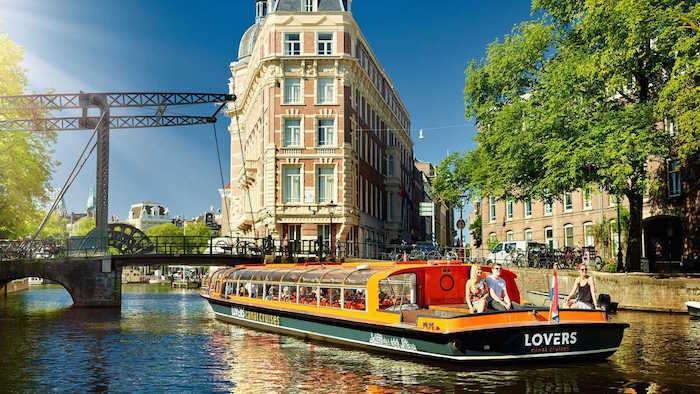 By signing up for this canal cruise tour in Amsterdam, you can get a unique perspective of this lively city. The 1-hour sightseeing boat trip allows you to get a closer and different look at some of the top attractions from the water! From the boat, you can take photos of the Anne Frank House Museum and numerous merchant houses from the Dutch Golden Era that have given the city its distinct and charming characters! Plus, this Amsterdam canal cruise deal gives you the opportunity to pass under the beautiful bridges that cross these canals. As you enjoy your boat ride and admire the stunning architecture of the well-preserved buildings, you can also listen to the audio guide and learn more in-depth about the history of each landmark that you are currently passing through. This Muslim friendly Amsterdam canal cruise online package includes a one-hour boat ride around the city with a GPS audio guide in 18 languages. It costs only $18.15 (€16) and it is way cheaper than the cost of buying the ticket on site! This pier is only 1-minute away from the Central Station by foot. To avoid missing the tour at your chosen time, make sure you arrive at the meeting point 30 minutes before the departure time (you can take selfies or photos while waiting for the boat to depart!). Avoid the hassle of having to buy an onsite ticket and make an early booking now! 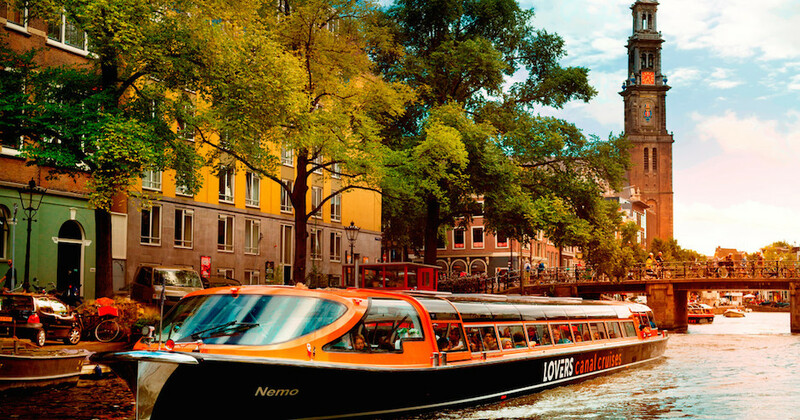 Book your Amsterdam canal cruise ticket now by clicking here. Indeed, it is one of the best ways to get acquainted with the city. 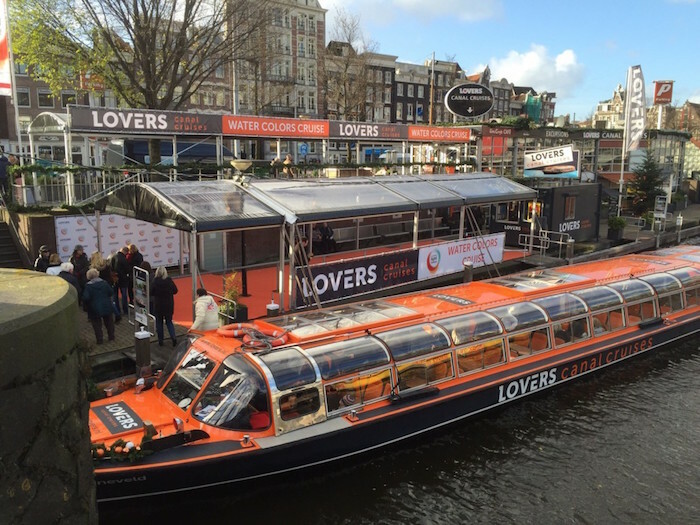 Buy the ticket now and get ready to enjoy a fun and relaxing boat ride while learning about the history of Amsterdam!